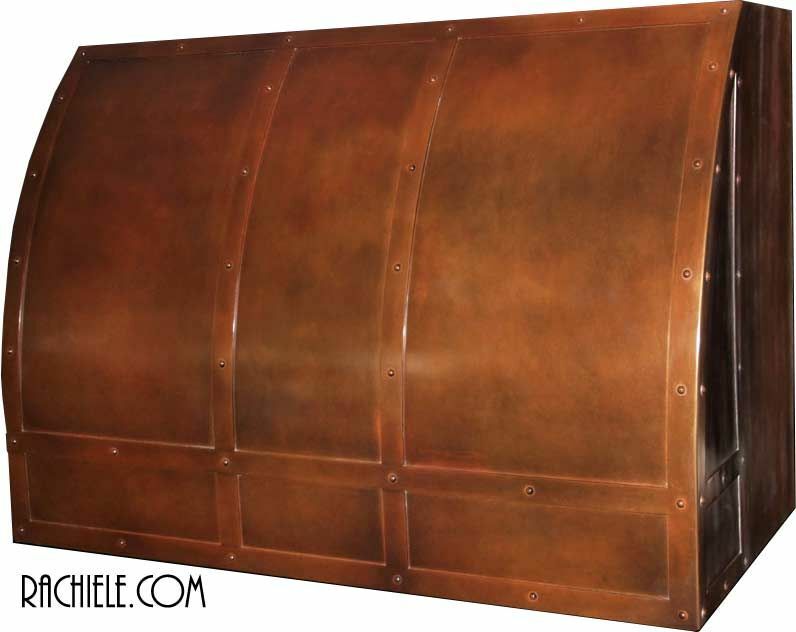 Custom Range Hoods of copper, brass and stainless steel made in the USA. High quality. 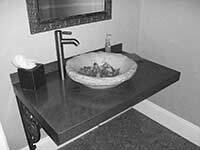 I am concentrating on exclusively designing and manufacturing custom sinks these days. There are so many nuances in sink design that I am constantly improving that I have discontinued offering custom hoods. Sink design has always been my passion and I do not want to dilute my efforts by expanding into a totally different market. There are many new laws in different States that require constant research into ventilation codes. There are local and State codes for "make up" air requirements and other nuances that I do not care to keep up with. Sadly, there are many companies selling hoods that may not pass local code requirements and it is late in the game to find that out when you are ready for a final inspection. This is the reason I am recommending Art Of Rain for my valued customers. 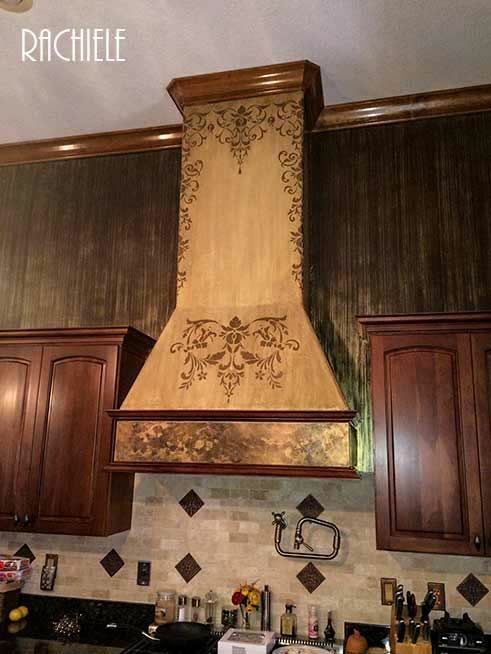 Range Hoods are their specialty. "Dino, I am writing to sincerely thank you for referring my husband and I to Max at Art of Rain in Washington for our copper range hood. Initially, I was a little concerned because of his distant location to us although you assured me not to be concerned. You were correct and my concerns were totally unfounded!!! Max was a pleasure to work with. The order could not have gone more smoothly. 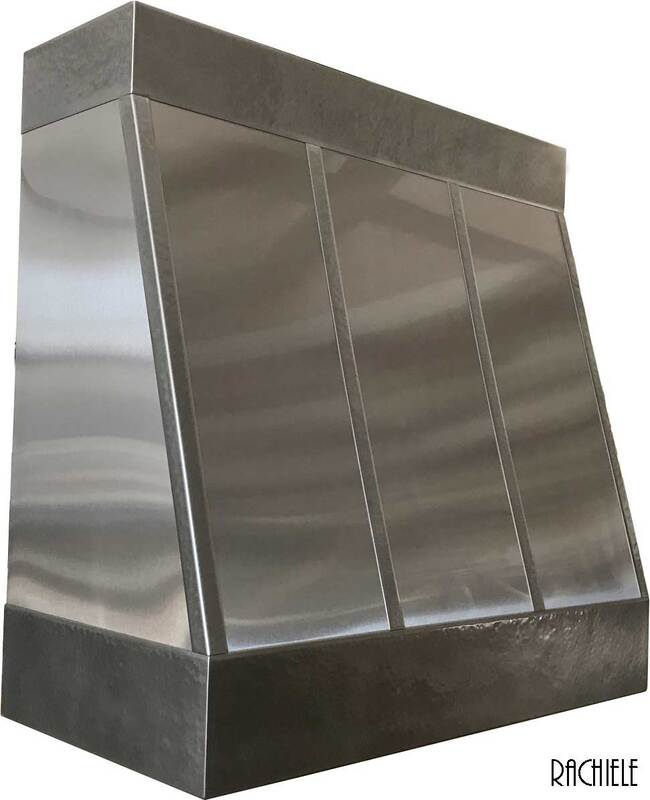 We received our range hood this week and it is truly a work of art. It is beautiful beyond our expectations. I highly recommend you continue to send your customers to Max for their range hoods (provided they are not buying from you!) Weâ€™ve struck up a relationship with him and hope to visit him in Washington on a future trip. I wanted to let you know how pleased we are and to thank you again. P.S. Our sink should be arriving on Tuesday next week. We are anxious. The photo you sent looks awesome! Sue"
The top portion of the hood is textured sheet rock. The bottom has a "U" shaped copper panel sandwiched between two pieces of cherry molding. Sometimes "too much" copper is just "too much". 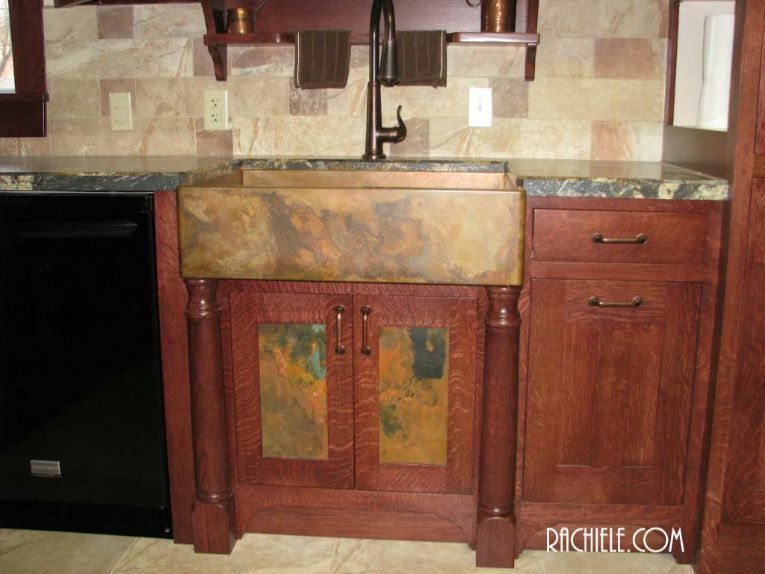 I thought this nice accent would tie in the copper sinks nicely without having a massive copper hood in the kitchen. 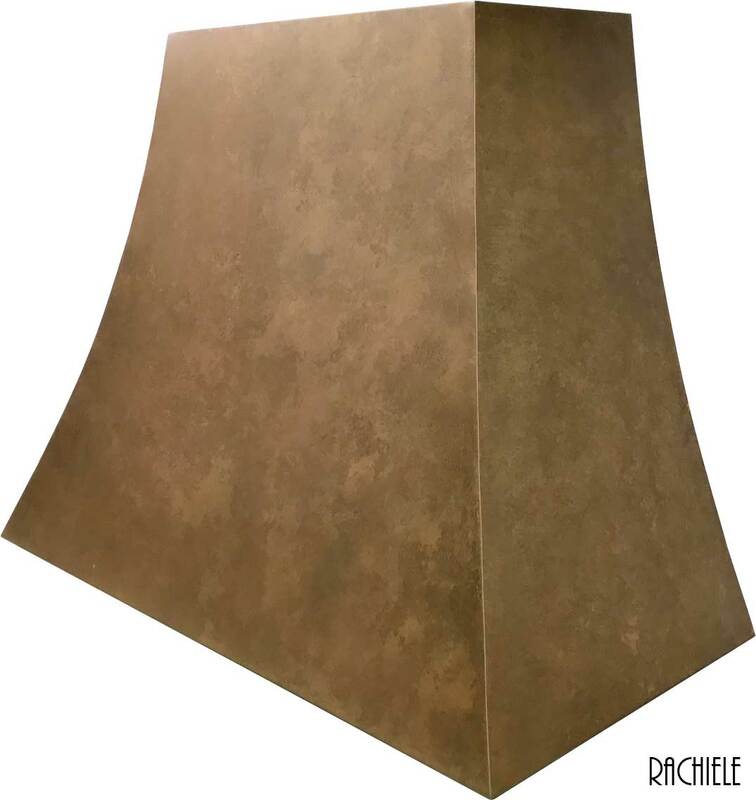 That all being said, this option, or something similar, will save you thousands of dollars and might just look better than an entirely copper clad hood. Oh... it only took me 10 years to finally complete my hood project. The area that is now copper was earlier painted a copper color. A hood band like this would be in the $900 price range. Well, we recently remodeled. (Feb 2014) This is a current photo. 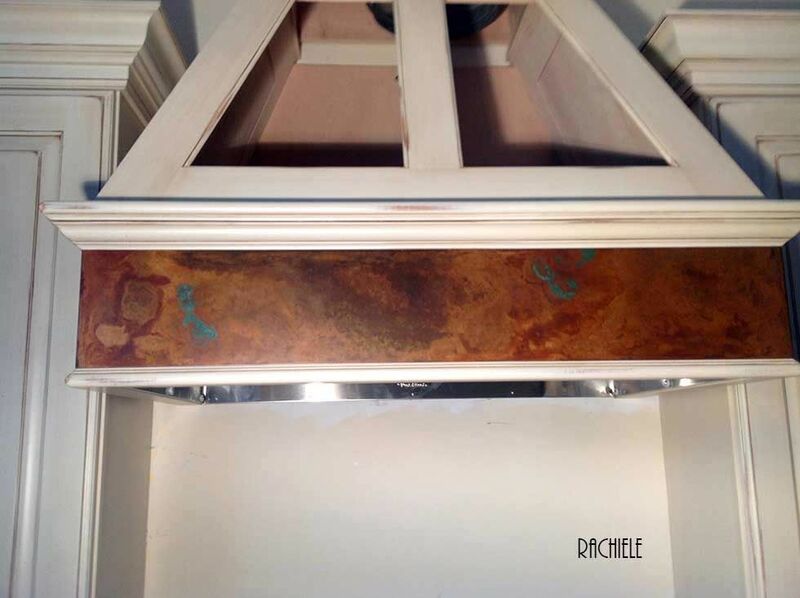 I changed the patina on the copper hood panel toward a gold tone. We had a faux painter do the walls and the stenciling on the hood. I felt a copper hood of this size would overwhelm the kitchen. (Even though I love copper!) Price range around $900 or so. The photo was taken before I changed the patina on the copper hood band to a more suitable gold tone. Our kitchen is constantly changing. One of the few constants is the copper counter top at the tallest part of the island. The other original piece is the large farmhouse sink with an integral backsplash. Had I known what I know now, I would have never designed that type of sink! It is impossible to replace. This is a photo sent in by a customer before they finished their kitchen. The hood is under construction, but you can clearly see the copper band. Nice job! This process is not only easy, but much less expensive than a totally copper hood. Price range around $900. 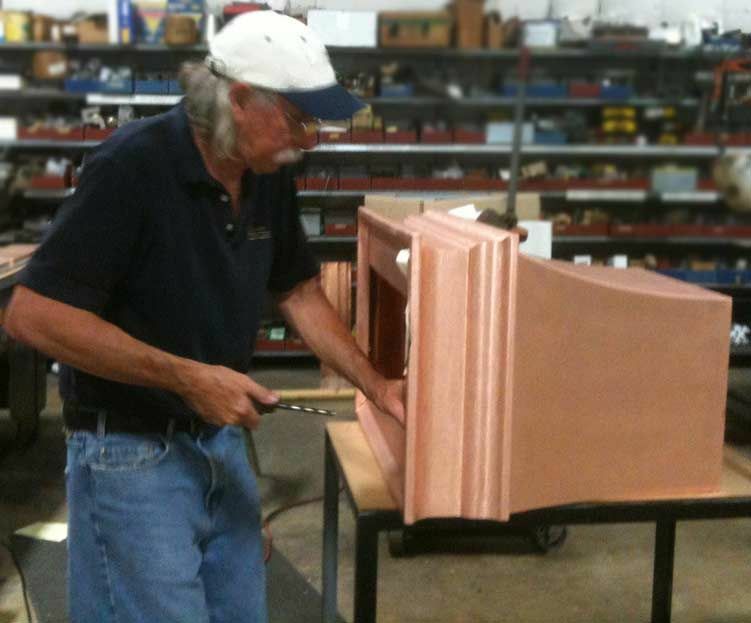 We also make matching dishwasher panels, refrigerator panels, back splashes, and door inserts out of copper. Just ask! The door inserts you see would each price out at about $500 with the Rustic Patina. A panel like this with a weathered patina would be about $150. Every detail is meticulously attended to. Don't mistake these for the hoods you see online or in stores. There is a vast difference. From the true hand craftsmanship of American artisans to the fine finishes applied by our metal workers, nothing is similar. A hood like this would price in the $10 to 15K range depending on size. This is certainly a one-of-a-kind custom hood. 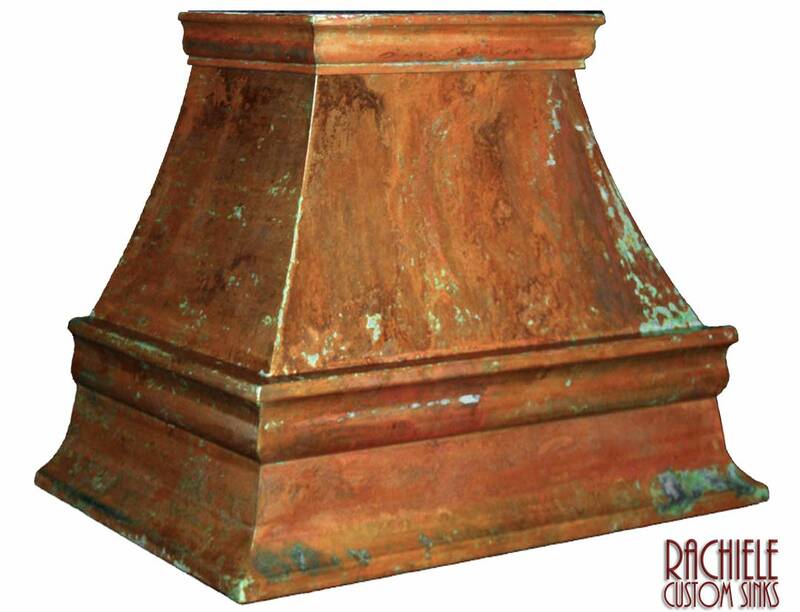 This is one of our most popular traditional copper hood styles. 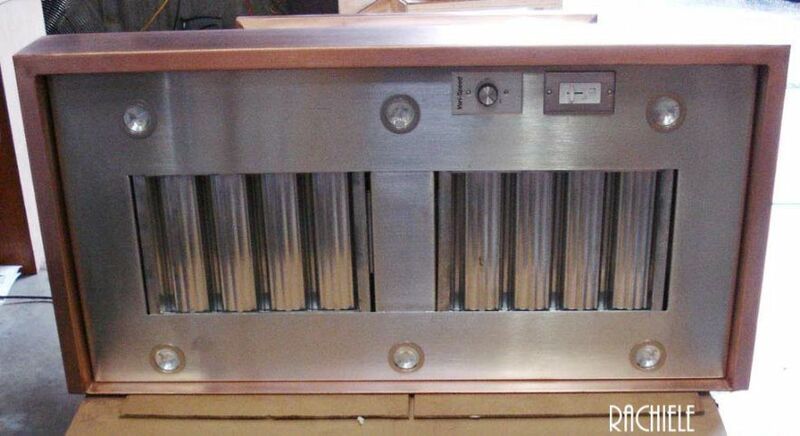 A copper hood like this would be in the $10,000 to $12,000 price range. Please do not compare our hoods simply based on price. Our value is reflected in the quality of the construction - which is very difficult to illustrate in photos. Our client base is looking for the best of the best. We ask you to supply the blower system. I have a local supplier that I can put you in touch with so you don't have to deal with the cost of shipping the hood fan system to me. Take a look at the high quality blower supplied by the homeowner. We install the blower system and ship the hood complete to you. This is photo of the above hood in the process of patination. 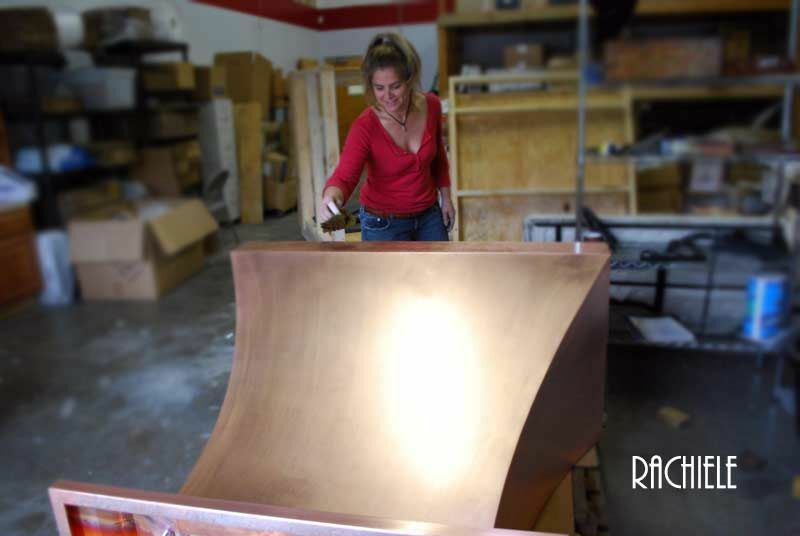 Applying a patina on a copper hood requires painstakingly tedious work. The time required can be as much as several days. This is photo of a wonderful combination of color in what otherwise is a white kitchen. Add a band of copper on your hood instead of a hood entirely made of copper. 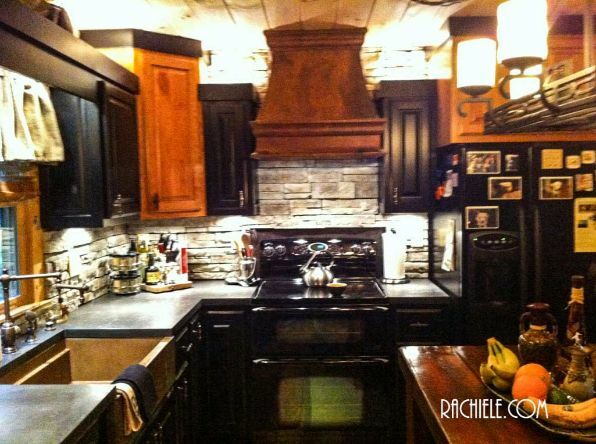 Sometimes an accent is more pleasing than a large overpowering copper hood. We matched the patina of the farms ink to with the band on the hood. 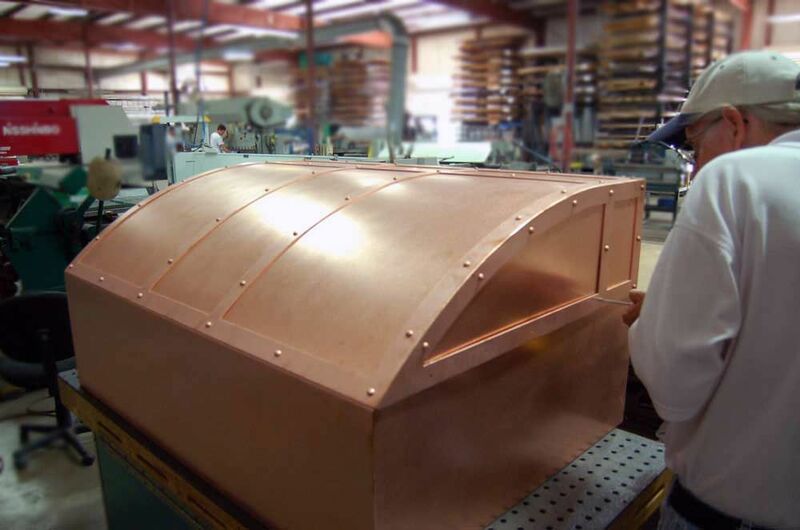 This is a custom hood with bands and rivets of copper.. 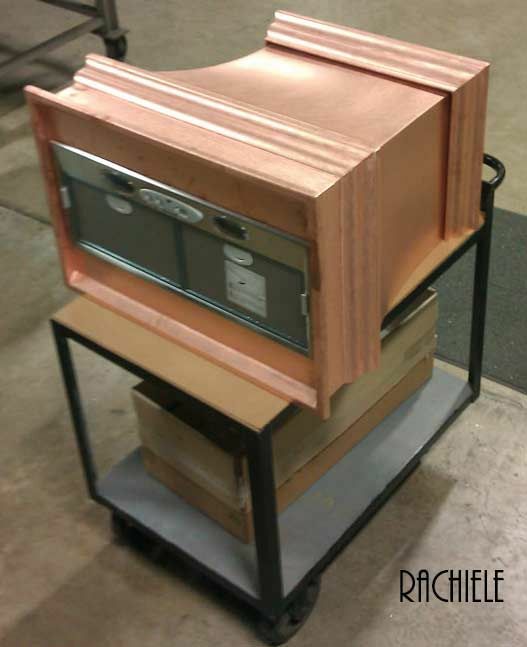 There is 200 pounds of pure copper in this hood! Make sure you click on the photos for detail. This is going to be an amazing hood when finished. Figure about $14,000 for a hood like this one. This simple style would be one of our lesser expensive hoods to make. Figure around $8K or more for one of these. Below, the finished copper hood with patina. This was a very difficult hood to build and finish. Very few craftsmen have the ability to build this. Even fewer have the ability to patina a hood like this. 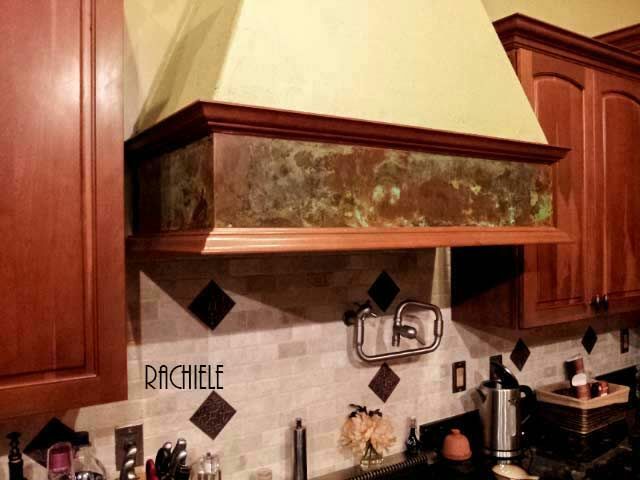 This is a custom copper hood with an awesome rustic patina. 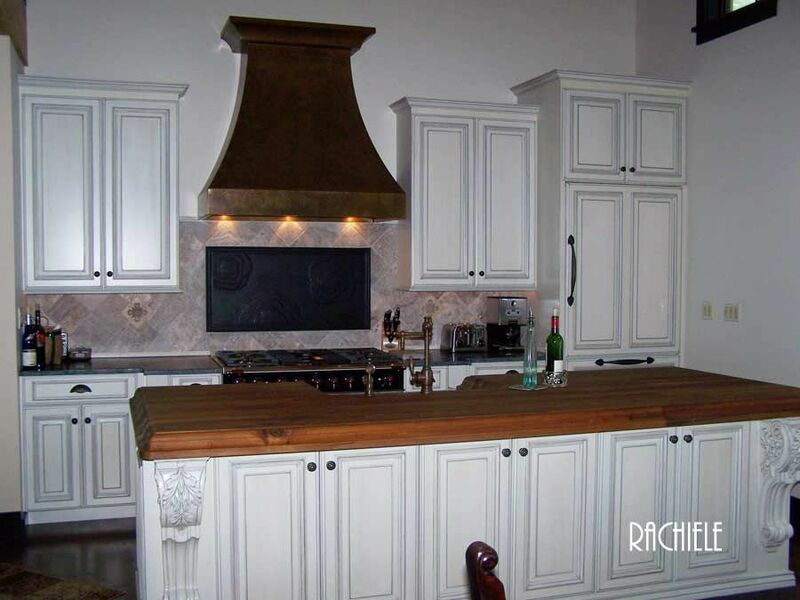 This hood was designed with a ductless vent, so we oversized the crown molding at the top to allow air to escape. The hood is ready for patina. You can see the finished hood in the photo to the far left. 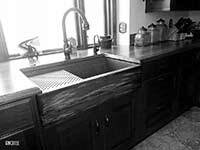 They also ordered one of our Signature Series workstation farmhouse sinks. This is a photo of the above hood taken by our customer with a cell phone. 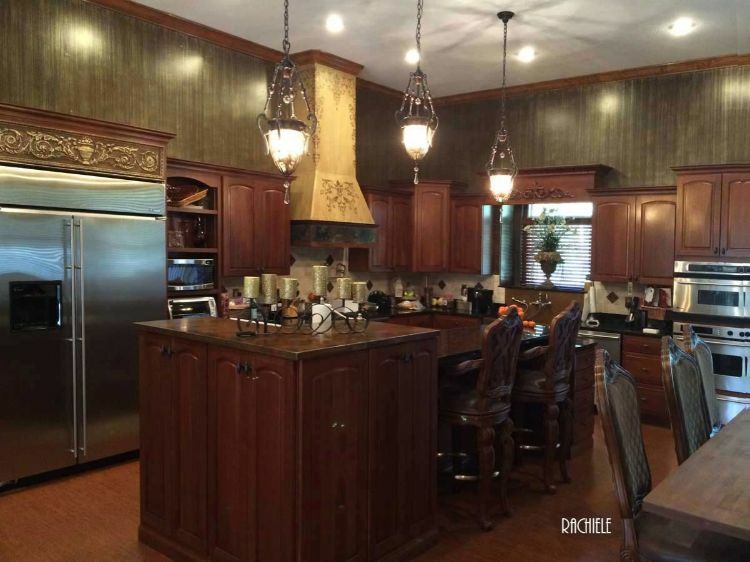 You can not see all the detail, but you can certainly tell this is a gorgeous kitchen. 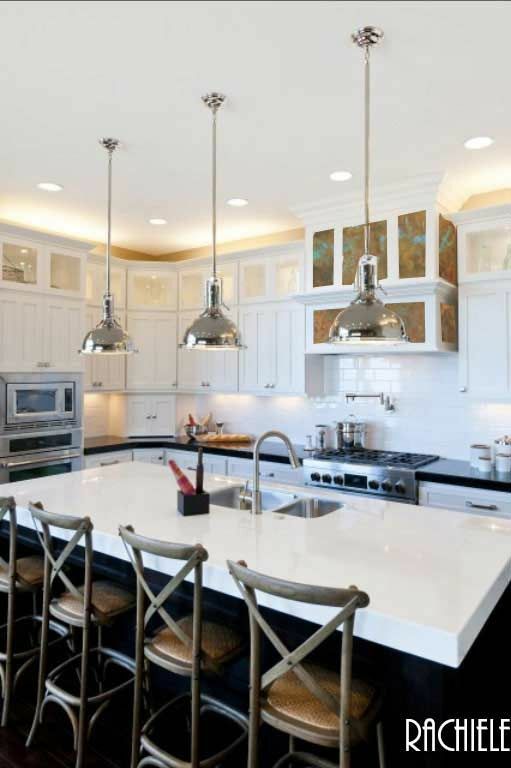 They have one of our Signature Series apron front sinks, and a Waterstone Towson faucet too! 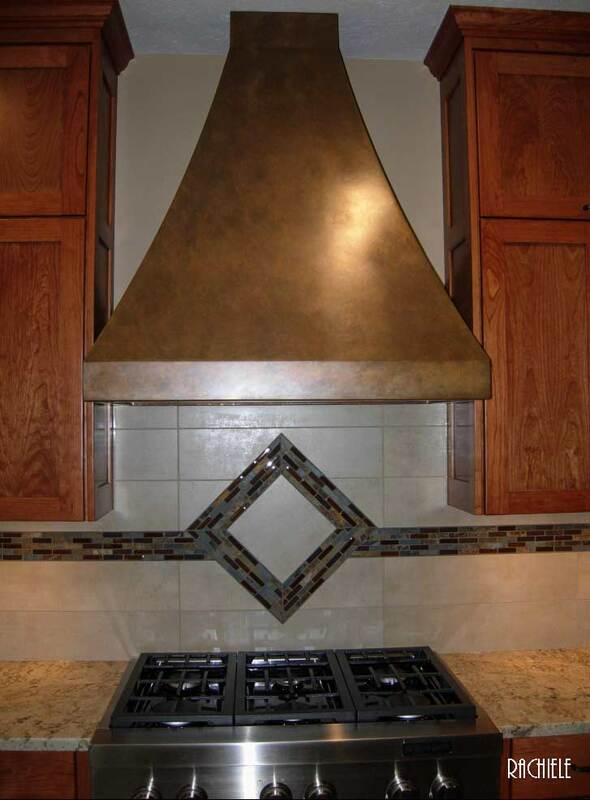 This custom stainless steel hood was made of two different types of stainless. The background is #4 brushed stainless. 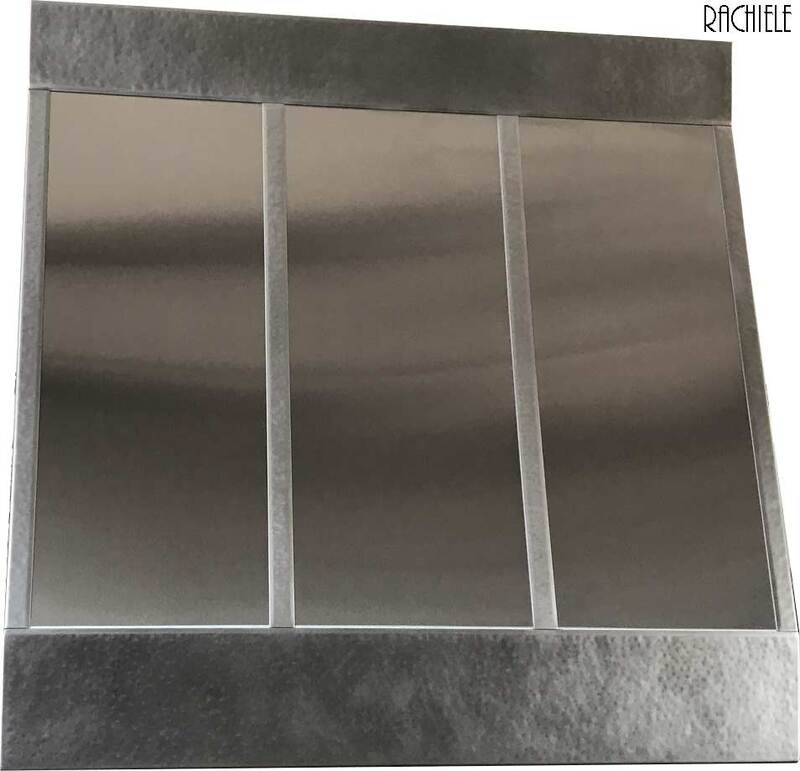 The strips, top and bottom areas are Rustic Matte Hammered Stainless. Hoods like this one take time. A hood like this will be in the $10-$15K range depending on size. 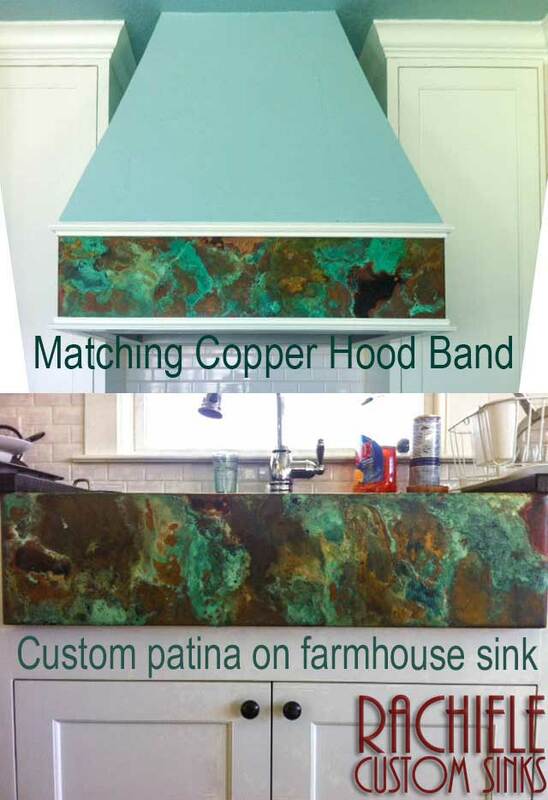 This client had already purchased a copper farmhouse sink from us and we matched the patina for her. 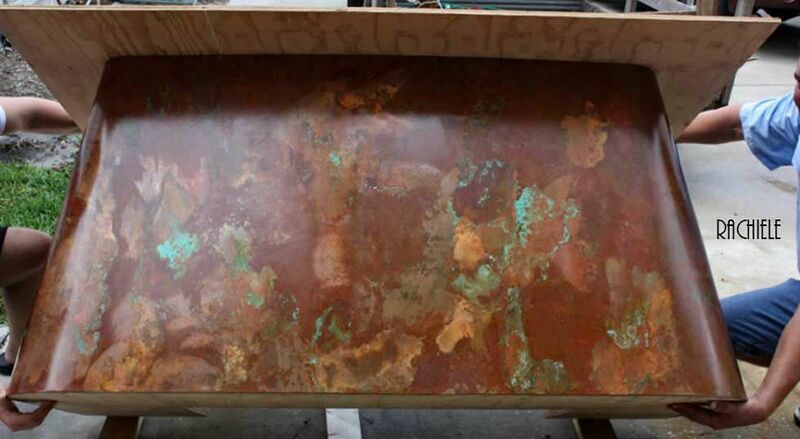 This is how to build a copper hood using one piece of copper!. 14 gauge cold rolled copper was formed in this shape. This photo was taken as we were packing it up for shipment. 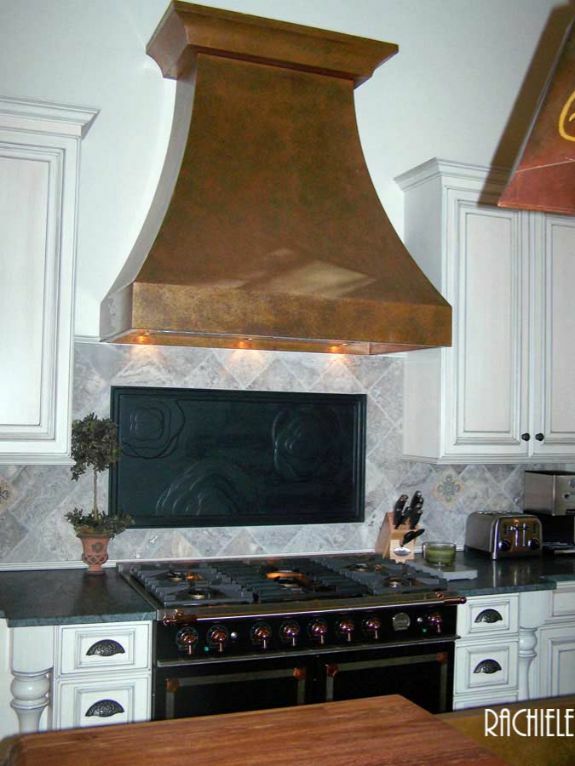 This copper hood sure made a statement in this kitchen! 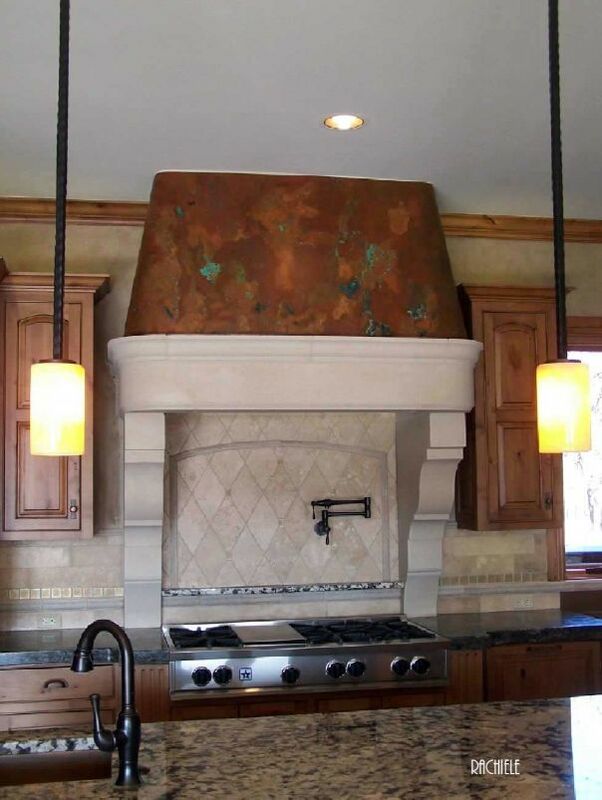 Copper hood with copper crown molding. 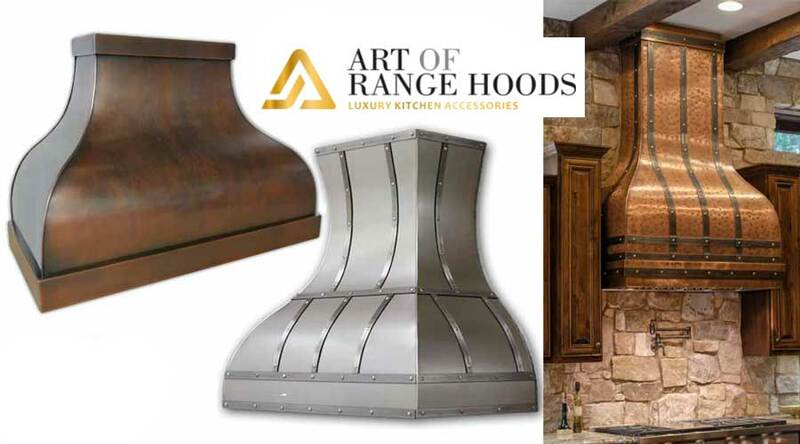 This is our most popular style of hood, and our least expensive option. Most hoods like this will be in the $8 to 12K range. Another view of the installed copper hood. 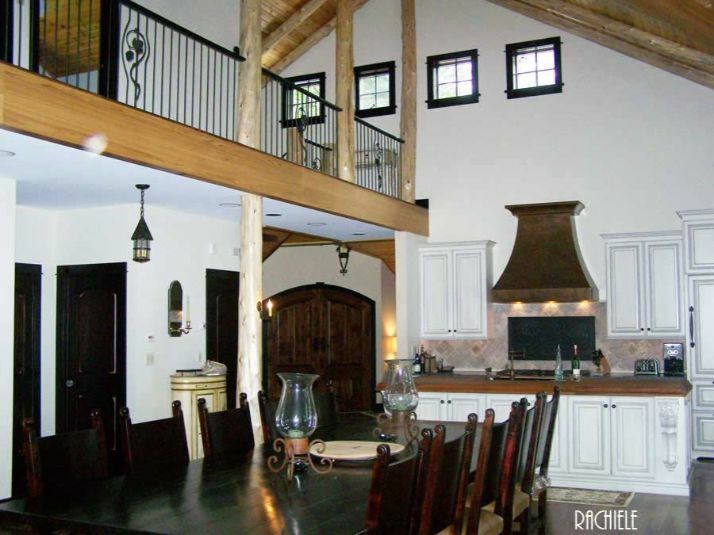 What a gorgeous home! These folks have two of our copper sinks as well. The island has a very thick walnut top with one of our under mount farmhouse sinks installed. I just had to show this photo. Check out the massive American Black Walnut Island counter top! 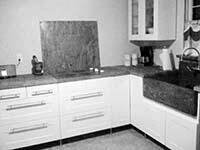 I am amazed at how many of our past clients have used walnut countertops. I think it is a great choice. 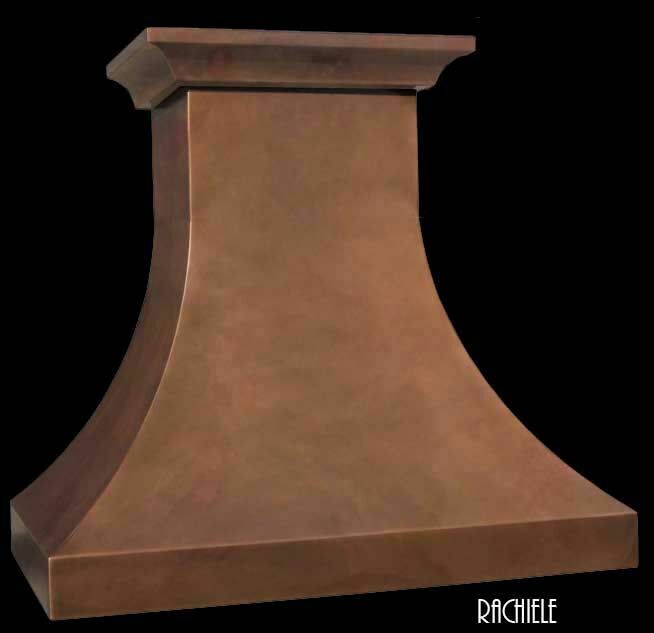 Rachiele is everything you need to create an awesome hood design! Shop Now!